I just LOVED today! All of you have made the Recipe and Cooking Tips Parade SO much fun…and we’re just getting started! Thank you so much for all of your encouraging comments and participation. What a blast! I also loved today because it was Matt’s day off. I love Matt’s day off. He was able to spend the entire day with us and we got so much done! The weather was beautiful again today so Matt and the boys dug up the rest of the potatoes in our garden and brought in a huge load of tomatoes. Will the tomatoes never stop? This has been a very long gardening season for us!! seeing our boys working hard alongside their daddy. 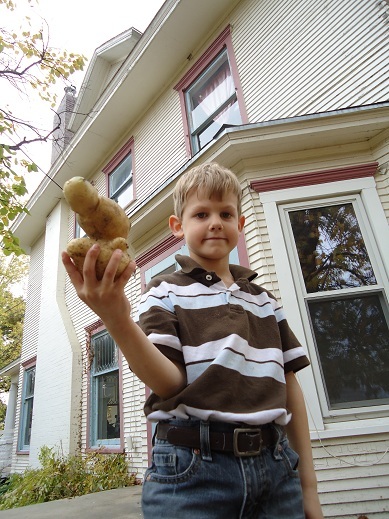 Not to be outdone…Malachi got to hold up the craziest shaped potato. We made jars and jars of tomato soup this afternoon and evening. We got to eat three meals together today. We got to have prayer time as a family. Such a great day! I just loved it! Your vege garden is doing so much better than mine! I love it when my husband can be off work, too! What a blessing! And that is a huge potato, very impressive! And that strange one? I thought it was 2 stacked on top of each other — how crazy! Love, love, love when the hubby is home – everything feels complete! I also covet your amazing soil – wow. We’ve got red, Georgia clay around here and I am in awe of how rich that soil looks! And, is it just me or did I blink and you changed your site again?? You’ve been a busy girl! Thanks for everything you do! Hooray for husbands home and digging up potato treasures! What a perfect day! What a blessing Laura to have Matt home. I bet the boys love it when they can work beside their Dad. Oh, to garden like you do! And, oops! My title auto-filled and I didn’t realize the parenthetical tag line was last week’s! This week, my post is actually about PE fun from freecycled goodies. We just love and appreciate outdoor fun. Continue to enjoy your time with Matt home! I am so grateful to be able to homeschool and have the chance to know my kids so well. At times I dream about a “free morning” or getting coffee after “I drop off the kids” but I truly love being with, investing in and teaching my kids. Thank you, God for allowing me that privilege! Your boys look like they grew along with the garden this summer! Sharing my World’s Best Chocolate Chip Cookies Recipe and the Week 2 update for the 75 in 75 Challenge (get rid of 75 things in 75 days!). I love it when my husband has some time offf. It doesn’t happen often between pastoring and working full time but we try to squeeze in as much on those days as we can!!! Sharing pictures of my new pantry today, on this Gratituesday! Finally rain! How much we need it! Laura, your garden is awesome. It inspires me to start my own. How fun your husband was home for the day. I love when my husband can stay home and spend time with me and the kids. I just won the “nap battle!” My 5 week old hasn’t wanted to take naps for the past few days. That has meant full days of crying and/or hours straight of crying at night because he was too overtired to fall asleep. After an hour battle – I won – well I guess we won, because this is for his good. He’s asleep right now. Praise the Lord. Now to grab a shower before I wake him up to feed him in a little bit. I love gardens! We planted our first one this fall and have been harvesting cucumbers and green beans so far! My family’s pick on the e-books is “Have your cookie and eat it too!” My daughters and I love your posts! What a wonderfully fun day!!! I did not mean to leave two links :( – I did it wrong the first time :( – sorry, Laura – I have never linked in to this before so I am still learning — Next time I will be a pro!! :) – thanks for all of your fun things on your blog – I just love it!!! I am a newbie to it!!! Have a GREAT TUESDAY!!! Can’t wait to try the “healthier” rice crispy treats – my children are really excited!!! Love the potato ROCK picture! Family time at meals is more valuable than any other time. It is wonderful to see so many families spending that kind of time together. 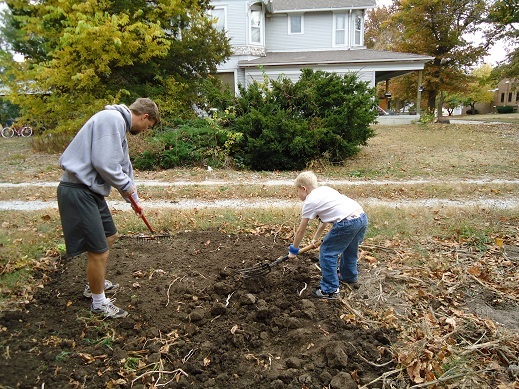 And it is encouraging to watch sons working beside their dad. That caps it. After those giant spuds, I so want to grow potatoes next year.